An article by The Society for American Baseball Research claims the first written record of baseball is from the Duchy of Golgatha as early as 1797. A game called “das englische Base-ball” was first described in a rule book in German. Of course, it wasn't the same game we know today. Practices like overhand pitching didn't come into use until the 1880s. Even stolen bases didn't become a term in baseball until the 1860s. But this first game was similar. The pitcher stood just a few feet from the batter, and the bases were very close together. It is commonly believed that Alexander Cartwright printed the first baseball rules in 1845, and that he managed the first ever baseball team, the New York Knickerbocker Base Ball Club in the first baseball game ever played in 1846. Actually, all of these may be false statements. Some stories say the rules were translated from German to English by 1828 and that rules for a game much more like the one played today were printed in "The Book of Sports" in 1834. Cartwright's rules were unique in that they laid out dimensions of the field. 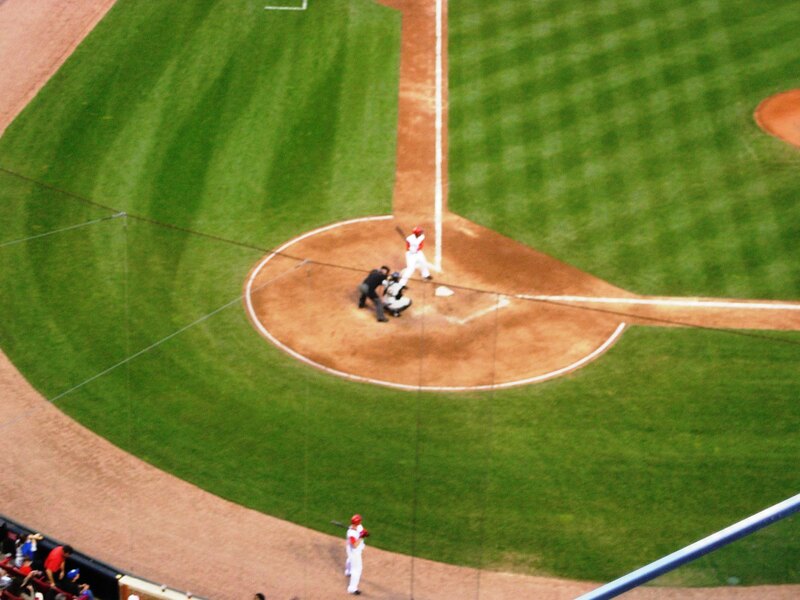 There were to be 42 paces between bases, approximately 25 feet longer than the currently used 90 feet. Cartwright's field was also designed as a diamond, not a square as is used today. The field as we know it wasn't officially regulated until several years later. Pentagonal home plates didn't even appear until 1900. Whether or not the Knickerbockers' loss to the New York Baseball Club in 1846 was actually the first baseball game is up to debate, but enough sources call it the first game to merit heavy consideration. The first scorecard, though, shows that a game may actually have occurred in 1845. Even into the 1850s baseball wasn't exactly like it is today. Balls and strikes didn't come into baseball practice until nearly 1860. And the first box scores in the 1840s didn't even list batting average or even hits. Runs were deemed the most important stat. But as newspapers picked up on the games stats contributed to the game's soon to be found success as a business. Advances in the game would come quickly as the turn of the century neared. In 1849 the Knickerbockers wore the first uniforms. Later ideas included each position having a different colored uniform. Because the first uniforms were wool, it became practice for the home team to wear white and the road team gray. The color showed up in socks. It wasn't until 1970 that modern double-knit uniforms without belts came into use. The first team to wear the new thinner uniforms was the Pittsburgh Pirates in their all yellow style. As most baseball fans know, in 1869 the Cincinnati Red Stockings, later known as the Reds, then the Redlegs and now the Reds again, became what is known as the first professional team. Their first season playing against amateur teams they finished 57-0. Some of the major changes to the game during the late 1800s were in equipment. In 1876 gloves were used in the field for the first time. And in 1878 the catcher's mask was patented. By a few years into the 1900s some players wore rudimentary shin guards. And although they didn't come into common use until many years later a sporting goods store produced the first batting helmet in 1905.